Congratulations to Jenae – Recent graduate of K-State! KS-LSAMP would like to congratulate Jenae on completing her baccalaureate degree at K-State! Jenae has been an active student during her time here at K-State. She was accepted into the Developing Scholars Program during her freshmen year. This program is for high-achieving, serious-minded students to conduct research projects in their field of study with faculty mentors. During her second year at K-State, Jenae had the opportunity to study abroad in Germany. Upon her return she next participated in a co-op with Cargill as a project engineer. Jenae worked at their Nebraska facility for eight months before returning to K-State. During her junior year she transitioned from being a DSP student to a LSAMP-DSP student and continued her research with Dr. Placidus Amama. 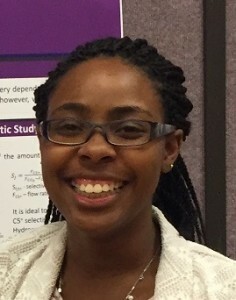 She has presented her research several times at the Developing Scholars Research Symposium. Most recently she was awarded a LSAMP travel aw ard to attend and present her research at the 42nd Annual National Society for Black Engineers (NSBE) convention. 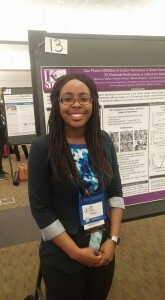 Her poster was titled “Electrochemical Characterization of 3D Nanocarbon-Based Electrodes for High-Performance Lithium-Ion Batteries”. Jenae is completing her degree in Chemical Engineering and will be working at Chevron Phillips in Texas.